New Delhi, 12th August, 2018: Series Of Resourceful Programmes In Front Of Enthusiast Audience Turned The Venue Of Literary Carnival Into A Confluence Of Creative Writers, Energetic Journalists, Committed Filmmakers Attracting A Sparkling Gathering At Hindi Bhavan, New Delhi, Organised By Jashn Events And Promoters. 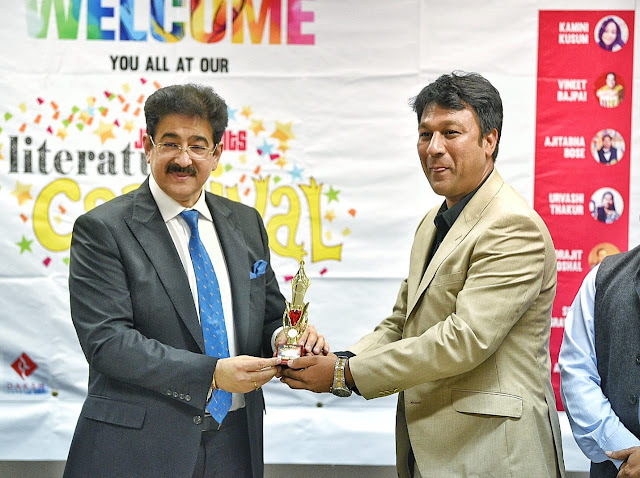 Inaugurating The Festival, Dr Sandeep Marwah (Founder of Film City & Directr Marwah Studio) Appealed To The Litterateur And Authors To Contribute For The Mission To Build A Culturally Sound Society Through Their Literary Pieces Reflecting The Truth. Delhi Welcomed Over 15 Authors & Poets From different cities. The Festival Witnessed many Panel Discussions, Many Book Release & Readings, Poetry, Talk show , Book Reading, Book Signing, Book Display In Presence Of well numbered crowd. 15 years old Author Paakhi Maheshwari, Abhishek Khanna from Lucknow and Abhishek Goswami are launches their books. Vineet Bjapai, Tanmay Dubey & Indrajit Ghoshal, Tauseef Ahmed were Speaker at the event. This event was witnessed by many eminent personalities as a Special Guest : Mr Sushil Bharti ( Director Broadcasting, Marwah Studio), Special Guest : Dr Mridula Tandon (Social Activist, Founder of SAKSHI a non profit organisation), Sharmila Bhawmick (Senior Journalist ), Mahendra Shrivastava (Founder and Director of SRA Legal & Risk Consulting Pvt. Ltd Company & Rajkumari Shrivastava (Director verify India). Many Prominent Writers From The Mainland India Including bhishek khanna, Lahar Bhatnagar, Anuradha Prasad, Tanmay Dubey, Diwakar Pokhriyaal, Abhishek Goswami, Kamini Kusum, Vineet Bajpai, Ajitabh Bose, Tauseef ahmed, Indrajit Ghoshal Etc Also Participated In Different Sessions Of this event. First Of Its Kinds In The Region, The Festival Witnessed Overwhelming Response From The Participants To Various Sessions. With This Unique Festival, The Expanding City Has Emerged As An Important Venue Of Literary Carnival.